Summary: Lisa Houk, a teacher-consultant with the Oakland (MI) Writing Project, details a structure in which “host” teachers provide opportunities for observation by “guest” teachers in a format that allows for preparation, facilitation, and debriefing. 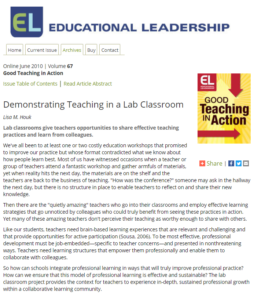 The lab classroom is an in-house professional development model that takes place in a host teacher’s room during the normal school day, framed by a preobservation meeting and a debriefing session. Like surgical theaters where doctors observe actual operations in progress to hone their techniques, the lab classroom provides an authentic opportunity for colleagues to see ideas in practice. Because the model provides for several sessions throughout the year, teachers have the opportunity to share and discuss the successes and challenges of their independent practice with their colleagues, continually improving.